These three structures are modular in that the pergola can be expanded by adding more posts, thereby creating a much larger structure. Each of the styles can exist as just one segment, creating a gateway type entrance: consisting of two posts, two brackets, a main beam and a series of short rafters. 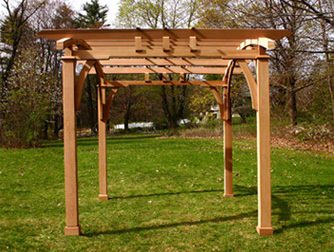 A typical pergola however consists of four posts and the respective sizes are listed below. The size of these pergolas make them extremely well suited for covering decks, patios, hot tubs and terraces, as well as gardens and walkways. All of the modular pergolas are very easy to install and are shipped via UPS for our standard shipping charge as outlined on the Ordering/Pricing page. Each structure has many unique details that set them apart. 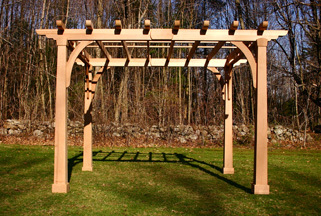 Define an area for alfresco dining with this elegant pergola or create an outdoor living room under its inviting canopy. 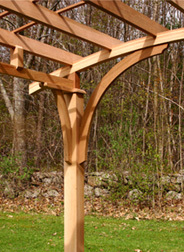 This Arched-Top Pergola is 8' x 10' on center, post to post, and employs a soft curve to its main beams. 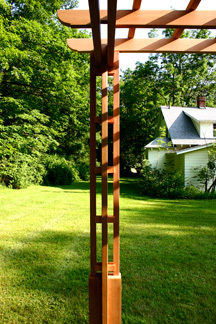 The beams sit atop caps that extend from the 5½" x 5½" posts. The rafters are notched over the beams and are flared as they follow the curve of the beams. 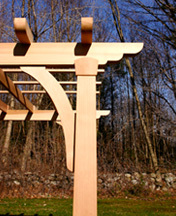 Long curved brackets accent and support the main beams, while providing stability for the structure. 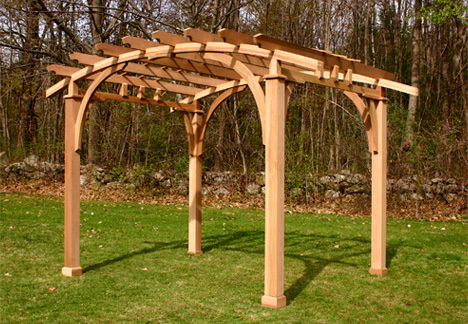 Exceptionally well crafted and beautifully detailed, the Arched-Top Modular Pergola is available in larger sizes by adding additional posts. 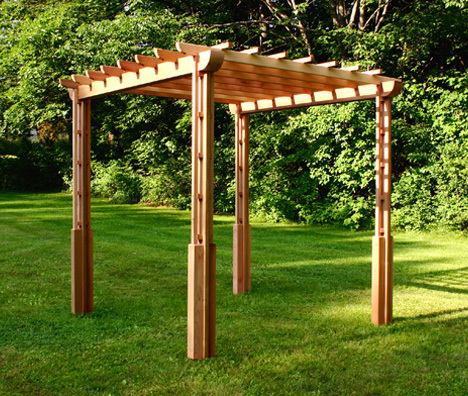 Our Mission Modular Pergola is 8'10" x 10' on center, post to post, and is the quintessential Craftsman style pergola offering understated sophistication. 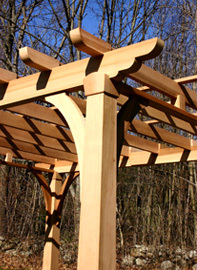 The pergola consists of 7" to 5" tapered posts with plinth bases and tapered and rounded capital inserts. 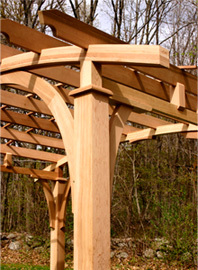 The main beams are 3" x 7" and are connected to each other by a detailed assembly, all supported by eight brackets. The rafters are a sturdy 1½" x 5" piece notched over the main beams with added rafter tail profiles. 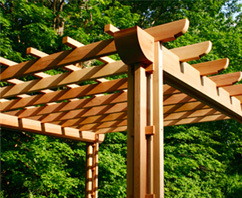 As with all of the modular pergolas, the Mission Modular Pergola is available in larger sizes by adding additional posts. 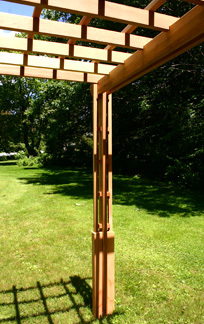 The Trellised Modular Pergola is 8' x 8' on center, post to post. 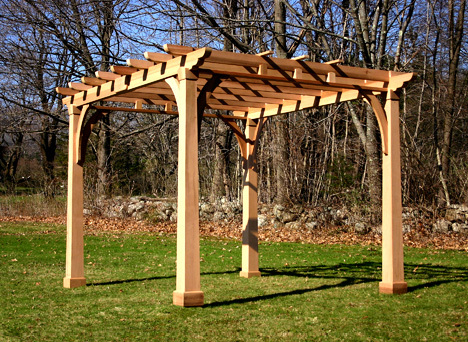 The pergola has very clean and simple lines and incorporates trellised posts to facilitate vine growth. This structure is particularly well suited for establishing a vine covered colonnade, or walkway, by adding two, four or more posts. The width could also be narrowed to create a smaller span over the walkway. A number of different configurations are possible with this well built, versatile structure.